A densely upright columnar small tree with green foliage. 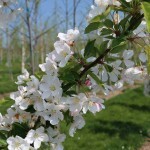 Blooms profusely in the spring with white flowers that are followed by bright red fruit. It has excellent disease resistance. 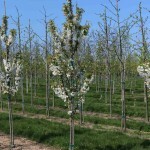 Introduced by the National Arboretum in the 1980's.